Accessible Ltd deliver the BEST training, through years of actual on the job work experience, in Burnley, Nelson and Colne for Driver CPC certification, MiDAS, Wheelchair Tie-Down and Health & Safety. Our trainers are here to help and guide, NOT dictate. Accessible Ltd are based from our Head Office in the Northwest. Accessible Ltd are on the Lancashire – Yorkshire border, Covering Accrington, Blackburn, Burnley, Clitheroe, Colne and Nelson. Accessible Ltd deliver the BEST training in Driver CPC Certification, MIDAS (Minibus driver training scheme), Wheelchair Tie Down/Anchoring training, and Health & Safety training incl. Forklift Training & Certification, Vehicle Banksman Training, Site safety awareness training, manual handling, abrasive wheel, confined space, and Face Fit Training. Have your driver training delivered by Ex Drivers, that have have actually tramped the UK. . Flexible course times to fit in-between school contracts and specialist PCV modules, for the Bus & Coach industry, also Mini-Bus/Coach module. 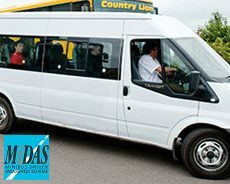 Midas (minibus driver awareness scheme) is a nationally recognised driver qualification, which increases driver skills and safety for minibus drivers and operators. Accessible Ltd driver and operator training will meet your operational and legislative requirements and will further improve your drivers and operators proficiency. Accessible Ltd’s nationwide and bespoke industry standard training, is delivered to a certified standard in the following disciplines. Wheelchair tiedown/Anchoring & occupant restraint safety systems.